The Havasupai Tribe once inhabited the area in Grand Canyon that is now known as Indian Garden and once you arrive, you will see why they once called this place home. This is the easiest Grand Canyon hiking trip in the park, but you will not be disappointed! Indian Garden is the perfect trip for the hot summer months, beginning backpackers or for families with younger children. Camping at Indian Garden for two nights allows for you to set up a base camp about 3,000 feet below the rim. Then you can just day hike to the bottom and explore Phantom Ranch, the Colorado River and Bright Angel Creek, all with just a day pack. Or, spend some private hiking time and explore the Tonto Trail for expansive views of the canyon and the wide open skies above. 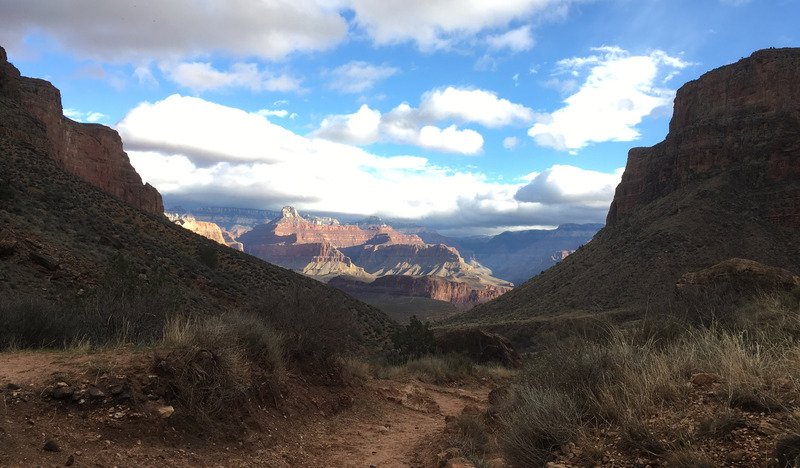 And, with our outfitting services for your Grand Canyon backpacking trip, your experience will be more enjoyable since we will do the footwork for you. Click here for more information about JRI’s outfitting services. The trip begins on the Grand Canyon’s South Rim, hiking 4.5 miles to Indian Garden via the popular Bright Angel Trail. You will end the backpacking portion of the hike at Indian Garden campground by Garden Creek and beneath a canopy of Cottonwood trees. Once there, choose from a number of possible Grand Canyon day hikes – Plateau Point, Colorado River, Tonto Trail, etc. Once you are finished enjoying the area, you will hike back out to the South Rim along the same trail. Need more information about the trail? Click here for the official Bright Angel Trail description from Grand Canyon National Park. *Please note: Due to the high demand and limited supply of permits available for Grand Canyon camping areas, we recommend having flexibility in your dates and open to alternate camp areas. We also recommend planning this hike at least five months in advance. 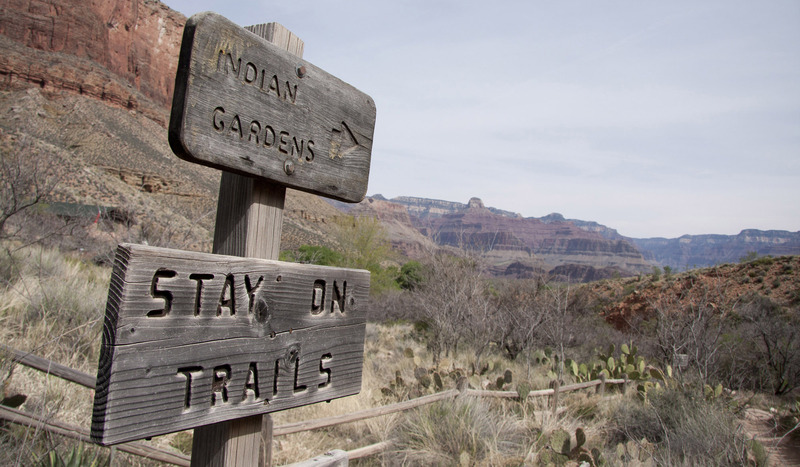 Hike down the Bright Angel Trail to Indian Garden where you will camp for two nights. You will drop about 3,000 feet (914 m) over 4.5 miles (7.24 km). The hike usually takes between 2.5 and 3 hours to complete. Later in the afternoon, take an easy hike to Plateau Point for some amazing views of the inner gorge and the Colorado River. 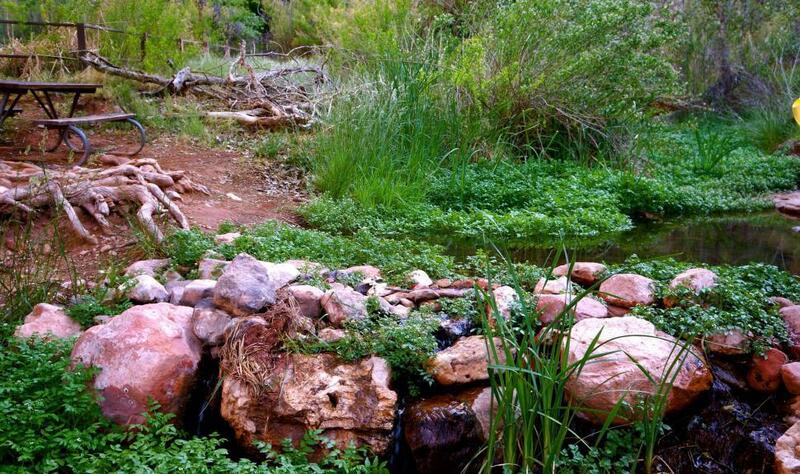 Today, shed your big backpacks and take a day hike to the river and to Phantom Ranch. The round trip hike is 10 miles (16 km) but you can spend significant time at the bottom and at Phantom Ranch, exploring the area – Colorado River, Bright Angel Creek and the canteen at Phantom Ranch. The change in elevation from Indian Garden to the river is 1,400 ft (427 m). 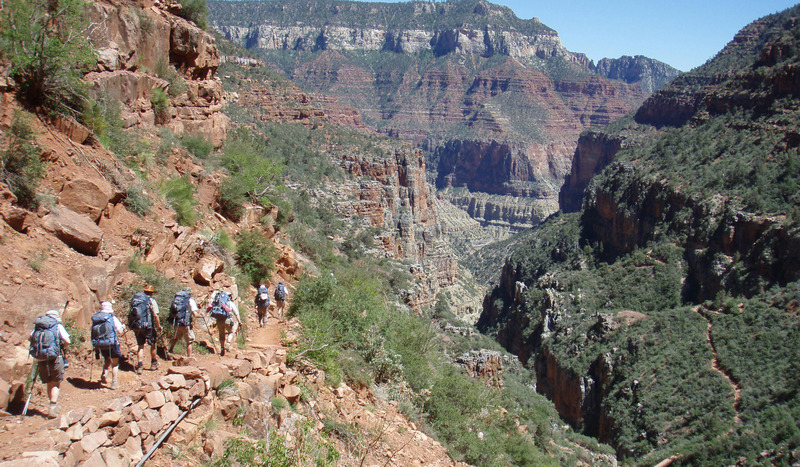 Pack up camp and hike out the way you hiked into the canyon along the Bright Angel Trail. The distance is 4.5 miles (7.24 km), climbing 3,000 ft (914.4 m) in elevation over that distance. Once at the top, set aside time to have lunch and souvenir shop or stay a night on the South Rim. The average time to hike out is between 4 and 5 hours. Does this sound like a great time? Well, it probably will be with proper planning and people you actually know! Check out our DIY (Do It Yourself for those of you out of the acronym loop) trips. We help you with the permit, planning, gear and food; the rest is up to you!